Google To Remove Featured Snippets from Search Results? If you’ve been following Digital Marketing Weekly for a while you’ll know that live streaming video is becoming hugely popular on all the major social networks. This includes YouTube, Twitter and of course Facebook. Live streaming video attracts thousands of viewers, and has engagement scores far and above other forms of social content. It’s also a great way to break down the walls between your brand and your audience. When anything gets this popular it’s bound to attract its fair share of people trying to game the system. With great power comes great responsibility, and inevitably people were going to take advantage of this, and to push the boundaries into the ‘black hat’ territory. Facebook shocked the video marketing world this week, when they started punishing live videos that aren't actually live. “Static, animated or looping images, along with polls on otherwise static or ambient backgrounds, will be pushed down for visibility,” and image-only Live videos have been banned. In other words Facebook Live Videos have to be “Live”. If you’re joining the thousands of brands and businesses who are taking advantage of Facebook Live Streaming Video, then make sure you stream only high quality live content. Avoid taking any shortcuts that might get your videos and your entire Facebook Account banned. While Facebook is the first of the big social platforms to take this stance, you can bet it won’t be the last, and YouTube and the other networks are likely to follow suit. Following on from the previous item, Facebook also rocked the social media world this week with a huge update to its News Feed algorithm specifically designed to completely kill clickbait. Facebook has gone on record saying that they’ve received overwhelming feedback from its users who have said that “they don’t like stories that are misleading, sensational or spammy”. Facebook have updated their News Feed algorithm to penalize posts that contain titles that “withholds information or if it exaggerates information”. Just to be clear on what clickbait is, they are “headlines that are designed to get attention and lure visitors into clicking on a link”. Many businesses and social media managers regularly use these formulaic, tried and true headlines to maximise attention and clickthroughs, so this is likely to have widespread ramifications. That doesn't mean you can't make your headline interesting, just make sure that the headline relates closely to your content, and don’t oversell or over-exaggerate the content of your stories. 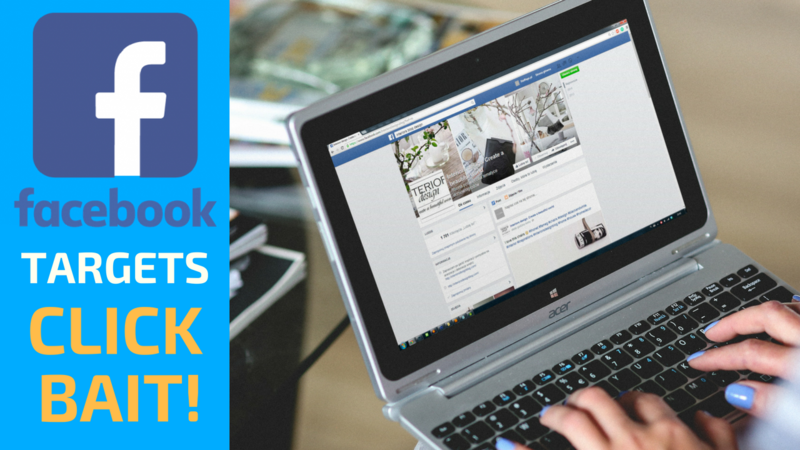 The good news if you’re using Facebook for your business is that if you can react to these changes quickly, you’re likely to do much better in the News Feed, and get higher engagement over your competitors if they are slow to adapt! In breaking SEO news this week, Google are testing the removal of featured snippets from their SERPS. Featured Snippets are those boxes of helpful content that appear before all the search results. They often directly answer your search query, without the need to click through and read an actual website.. In fact, savvy search engine marketers spend significant time trying to optimise for featured snippets. Not only does a featured snippet get them to the coveted top spot in the search engine rankings, but their listing would also appear in the regular organic results, allowing them to “double dip” and get twice the visibility! At the moment this change is something Google is only testing, and although it's not written in stone, it could become permanent down the line. Did you know that there’s an old, established marketing secret you can apply while creating content, that will make videos you create easier to watch, more engaging and much more memorable? This under-utilized technique makes your videos look more professional, attracts more views and get more shares. Effortlessly improve viewer engagement. Increase the overall watch time of your videos. Reduce the bounce rate on your website. AND Boost your rankings in the search engines! We put together a quick video that explains the technique in detail, why it works, and also shows you a 100% automated way to to quickly and easily apply this strategy to your next video. If you haven’t seen the video, then you can click the link in the description below and discover how to improve your video engagement and rankings today!